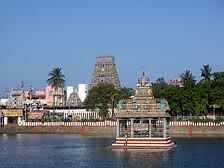 Here is some information about Kapaleeswar Temple in Mylapore (Chennai) Taminl Nadu india. from 4.00 p.m. to 9.30 p.m. Significance: Lord Shiva in the temple is a swayambumurthi. 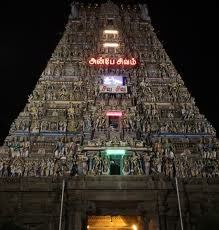 The Kapaleeswarar Temple in Mylapore, Chennai is a very ancient temple. The original temple was submerged under the sea & the current temple structure was a later construction. The Moolavar is Kapaleeswarar & Amman is Karpagambal. 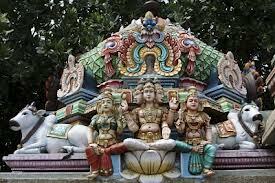 There are separate sannadhis for several deities such as Vinayagar, Annamalaiyar, Murugar, Saneeswara. There are several other deities such as Durgai, Dakshinamurthy, Chandikeswarar located within the main Sannadhis of Kapaleeswarar & Karpagambal. The temple tank lies opposite the tower.As legend has it, Lord Shiva is purported to have pinched off one of the heads of Brahma so as to arrest his pride. As a form of penance, Brahma installed a Shiva Lingam in this spot to do penance. This Lingam is known as Kapaleeshwarar. In the courtyard of the Kapaleeshwar Temple, you can find a small shrine of Goddess Parvathi in the form of a peacock worshipping her consort Lord Shiva. The suburb of Mylapore is said to have acquired its name from the words - 'myil' (peacock) and 'oor' (town). You will find the images of 63 Saivaite saints (Nayanmars) in the outer courtyard. The main entrance of the temple faces east with puranic legends inscribed on it. During the Arupathu Moovar Vilzha Festival in March - April, thousands of devotees throng the temple to participate in the 10-day festivity in honour of the 63 Nayanmars. 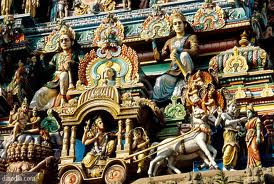 The bronze idols are taken in a colourful procession through the streets of Mylapore. This festival has become an integral part of the ethos of the local community. The temple tank is spruced up and filled with water. This festival has now become a much-awaited event, what with colorful and attractive kolams decorating the streets and music and folk festivals. You can witnesss the Kokkalikattai and koothu dances as well as the traditional thoippavai puppet shows. Connoisseurs can savor the classical music and dance performances. Taste some authentic cuisine on the streets of Mylapore. Mother Uma wanted to know the full meaning of the five lettered Mantra " Na Ma Shi Va Ya " and the glory of the sacred ash.She begged Lord Shiva to teach Her on these topics.While Lord was teaching Her, Mother Uma was attracted by the beauty of a peacock dancing before Her. Lord, for Her inattention, cursed Her to become a peacock. For relief from the curse, He advised Her to go to Earth and perform penance on Him. Mother Uma worshipped the Shivalinga under the Punnai tree in this place.Moved by Her penance, Lord appeared before Her and and confirmed Her release from the curse and named Her Karpagavalli. 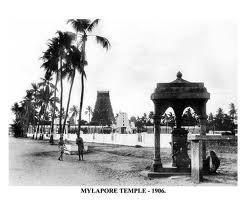 As requested by Mother Karpagavalli, Lord approved the name of the place Mayilai-now Mylapore. 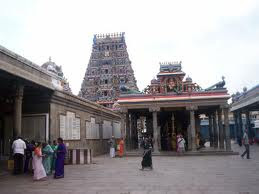 Kapaleeswarar temple was built in the 7th century by the Pallava Nayanmars. Nayanmars are said to be the devotees of Lord Shiva who worship him by singing hymns in the temple. They are more powerful such that whatever they desire, that will be fulfilled easily. 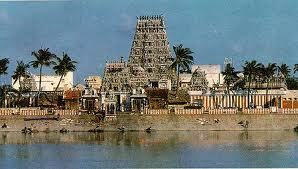 The Kapaleeswarar temple is built in such a way that it is made very attractive for the people who visit the temple. 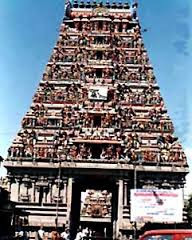 Kapaleeswarar temple is the biggest temple in the Chennai. It was built in such a way that it becomes one of the biggest attractions for the devotees. The view of the temple from outside will be very excellent to see. There is also a Pond in the temple which is known as the Kolam or Theertham which is useful for sacred activities. Some people also consider taking bath in that Kolam or Theertham as a sacred thing. Architectural fact is that the temple is a testimonial for the vishwarkarmas sthapathis. 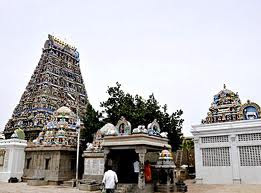 This temple is built based on the Dravidian style in which the Gopurams are situated along the streets and the main temple is sitting inside the gopurams. There are basically two gopurams making two particular entrances to the temple. 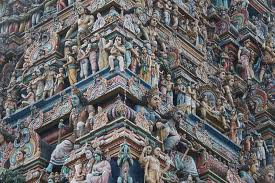 The height of the temple is about 40m and the gopuram that is present in the western side faces the Theppakulam or the so called tank of the temple. By Road: There are many bus facility available from all the parts of the Chennai to the Mylapore. 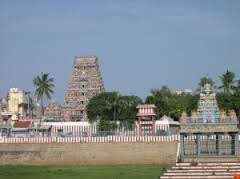 It is necessary that we should catch the local city bus from Tambaram or Koyambedu to reach the Kapaleeswarar temple if we are from any other part of the Tamil Nadu. By Rail:The trains are also available for reaching Mylapore. The nearest railway station is Mylapoore. By Air: The Nearest airport is Chennai airport. Which day the temple is closed for visit to general public? If some body know about the closing day of Kapaleeswarar temple pls msg me at 8551811334 (Whats app number).